The art book is presented in the landscape format, not the vertical format as shown on product images on the Internet. 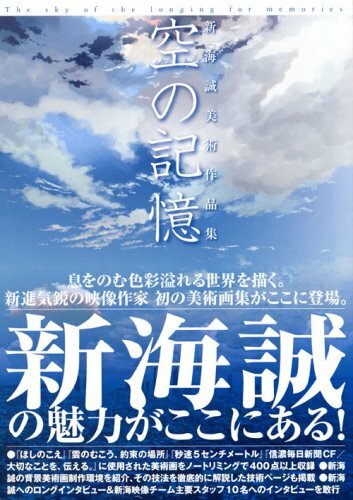 This book contains the background paintings from the three recent anime Makoto Shinkai (wikipedia) has created. They are 5 Centimeters Per Second, The Place Promised in Our Early Days and Voices from a Distant Star. If you've watched the three anime, you should know that the background art is stunningly beautiful. They are now collected into one book, reproduced brilliantly on the pages. The book's the size of two closed palms. Those illustrations could do better on larger pages. I've often wonder how Makoto Shinkai creates his art. The answer is he uses reference. He would either paint of his reference photos or 3D renders to achieve that eternal-spring look. Right are the back are step-by-step screenshots of his workflow process. He would create his art using Photoshop and Light Wave, then composite them in After Effects. The book is in Japanese and unfortunately, there are no translated editions around. Thanks for the book reviews, been checking your blog and it's been helpful. How do you purchase these books from Japan? There are several books I'm interested in getting, but I can't understand the Japanese version of Amazon. Any feedback would help and thanks again. When you visit the home page of amazon.co.jp, there's a link called "in English" somewhere at the top right of the page. That will roughly translate the Japanese words into English. The checkout process is in English. If you have bought from any other amazon branches, your information will be already there, you just have to confirm the price and information. I remember they ship by Fedex, which is pricey but fast. That's the only one option for shipping overseas. My last order was shipped by Fedex.